William Hill Poker is a poker room at the huge gambling site William Hill. This gambling site consists of a poker room, a bingo room, three casinos, one live casino and a large section for sports betting. The poker room is a part of the iPoker network. 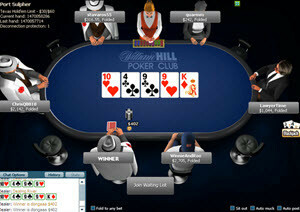 William Hill Poker is a part of the iPoker network and use the iPoker poker software. So, if you have played at any other poker room within this network, you will recognize the basics. The iPoker poker software comes with features such as buddy list, quick seat option and auto-top up. As far as graphics and animations go, iPoker is rather rudimentary. William Hill uses software from some of the biggest games developers in the world that also make the best internet casino games. Visit www.internetcasinon.eu to find out more about what casino games that are offered on the internet. 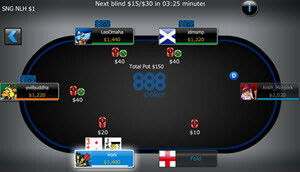 iPoker’s variant of fast poker is called Speed Hold’em Poker. Just like the other variants of fast poker, Speed Hold’em Poker will move you to a new table as soon as you discard your hand. You don’t have to hang around and wait for the other players to finish a hand that you are no longer involved in. Since William Hill Poker is a part of the iPoker network, you will have access to all the tournaments arranged by this network. The tournaments with the largest guaranteed price pots are held during the weekend, including the famous $250k Sunday GTD. Satellites are available to all of these big GTD tournaments. William Hill Poker have tournaments where you can win a travel package to major offline tournaments such as World Series of Poker (WSOP). Satellites are available to these qualifiers. There are plenty of free rolls to play in at William Hill Poker, most of them for Texas Hold’em. Every week, William Hill Poker have special tournaments with $2,000 or $3,000 in the price pot, tournaments to which you buy in using William Hill points instead of money. Since William Hill Poker is a part of the iPoker Network, you can participate in iPoker’s Online Poker Series (iPOPS) here. William Hill Poker is a part of the iPoker network. A majority of the poker rooms in this network are poker rooms attached to large gambling sites chiefly visited by sports betting punters and casino gamblers. When sports betters and casino players drift over to the poker rooms, they often play rather soft and take large risks. At the No Limit Texas Hold’em tables within the iPoker network, it is not unusual for the see-flop percentage to be 40% or more. In terms of traffic amounts to cash game tables, iPoker is close to the top, but tend to stay below not just PokerStars but also 888 Poker and Bodog. During your first three months after registering with William Hill Poker, you can play in daily beginners freerolls. These freerolls have $50 or $100 in the price pot. You get a 100% bonus up to a maximum of $1,000 on your first deposit to William Hill Poker. Sometimes there will be campaigns where you get a 200% bonus up to $2,000 instead, so looking for bonus codes online before you do your first deposit can be profitable. Sometimes you need to go through an affiliate link to get this type of special welcome bonus. William Hill Poker recently changed their Loyalty Program to make it easier to reach rewards. You no longer need to turn-over as much money as before to get the first rewards. At the same time, William Hill reduced the maximum rakeback for VIP players. Apparently, William Hill Poker is trying to become more appealing to small- and midstakes hobby players as opposed to professional and semi-professional players that turn-over large amounts of money each month. You can collect William Hill Points and use them as buy in to special tournaments. The William Hill Poker support can be reached by phone, email, fax and live chat. The email address is support@williamhillpoker.com. The English speaking support is staffed 24/7. The company William Hill was founded in Great Britain by Mr William Hill in 1934, despite that fact that gambling was illegal in Great Britain back then. William Hill plc still have a large chunk of their business offline, with numerous betting shops located throughout the United Kingdom, Ireland and Gibraltar. In 2002, William Hill plc was listed on the London Stock Exchange.